Thinking of selling your home, or having a party? While a garden makeover may seem like an overwhelming task, if you know where to focus your energy you can get great results without having to fix everything. Use these four tips in the garden areas most likely to be seen first – near the front door, areas visible from windows or the patio where you might entertain, and next to pathways. Most people don’t see the details of a garden; they notice the overall effect. If you have lawn creeping into your garden beds, or weeds growing along the edges of your garden beds, cleaning up your borders so that you have a clean, simple, flowing line is an easy action that can make a slightly unfinished or messy area of the garden look tidy and cared-for. If an area has never had a defined border, try laying a flexible rope in a gently sweeping curve that encompasses all of your plants. Beware the common beginner’s desire to add more and more curves to your bed (creating the “drunken snake” effect!). When in doubt, use the fewest curves possible and go with the simplest border that looks appealing to you. Then just remove the lawn or weeds until you have a crisp new line. I use the ax side of my Pulaski to cut a clean line into the lawn, then use the mattock side to peel away the sod or weeds. In an existing bed, even if you won’t have time to make the entire bed weed-free and perfect, if you focus on making the edges look sharp, you will fool people’s eyes into perceiving the bed as tidier than it is. Taking the long view of your garden areas can help you focus on making the entire garden look good, and keep you from accidentally spending all your time making one small area perfect. Try the old artist’s trick of standing far back from each area and letting your eyes blur a bit. See what areas jump out as feeling messy or needing attention – bare spots, areas with a lot of weeds, dead foliage, or overwhelming areas where the trees or shrubs have gotten overgrown. If your mature shrubs have an undefined shape or just look kind of moundy and overwhelming, one quick pruning trick is called “skirting”. 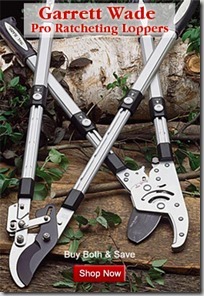 You go around the plant and prune off any branches or stems within 6 inches of the ground. This lifts up the canopy, gives the shrubs some semblance of shape, and draws the eye upward and outward through the garden. Don’t do this on weeping plants of course! 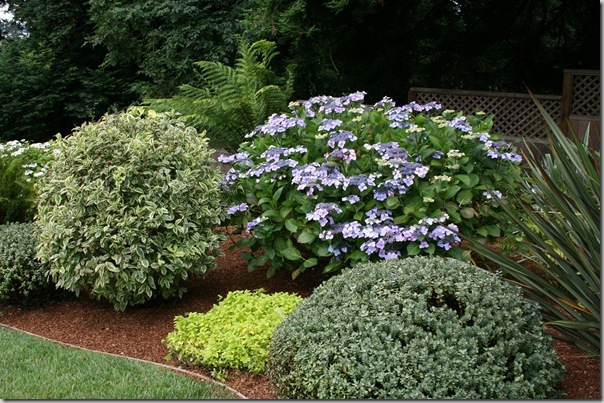 Nothing helps a garden look well-kept like a neatly applied layer of mulch/ wood chips. 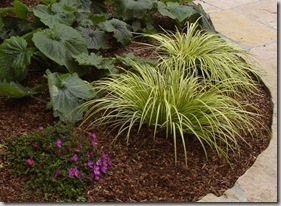 You can use any kind of natural mulch that looks appealing to you. I use the smallest size fir bark, applied about 3” thick, but if you have a slope, shredded bark sticks better and won’t wash away. If you prefer, try a 2” layer of high-quality compost. Don’t use potting soil, since it usually contains bright white perlite! Before you apply, smooth out the lumps and bumps in your soil. Put the mulch out in an even layer and rake it out. Pay special attention to making sure you bring the mulch neatly to the edges of the bed. If you can’t mulch the entire bed, get good coverage on the edges and the first few feet of the bed, then sprinkle the mulch in a thinner layer as you move towards the back of the bed. If there’s no distinct line where the mulch stops, most people won’t notice that the whole garden isn’t mulched. It can seem like a good idea to pick up some annuals or other flowers to fill in your beds, but often when you bring them home, they are too small to make a fast impact on the look of your garden. 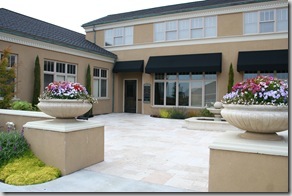 One way you can get that instant appeal is to use container plantings. Go for the largest containers you own or wish to buy, and only select a few, especially if you are selling your home. Too many pots, no matter how attractively planted, look cluttered and busy. Place them at strategic locations – near the front door, on the patio next to a boring area of garden bed, or even in a bed, if you can nestle it around some foliage so it looks like it fits in. Then choose a tall centerpiece for each pot, a few trailing plants, and enough annuals to make the pot look instantly full. Try to stick with the same few themes – each pot should have some of the same plants as another pot in the area. Repeating themes isn’t boring, it’s soothing! Alternately, you could choose one large, bold plant per pot and skip the froofy annuals. Go for things with architectural interest (showpiece plants with big, spiky, or interestingly textured leaves) or bold foliage color, and don’t be afraid to be a bit wild – that’s what containers are for. It’s one of my projects this season to neaten my edges with an edger (manual). As much as I like the look of actual edging materials (I mean, bricks, bottles, pavers), I have so many edges that HAVE to be mowable, not requiring weedwhacking. Eh yep. Love the drunken snake comment! I tell my clients to do the same thing, use a hose or rope, when designing new bed lines and it’s like a lightbulb suddenly goes off for them. I also tell them to bring out the lawn mower if applicable and make sure the lines are conducive to easy mowing. No need to re-cut bed lines twice. I’ll be back to watch the skirting video. I love that tip and will be passing it on to my clients. .-= Debbie´s last blog ..Wordless Wednesday =-. 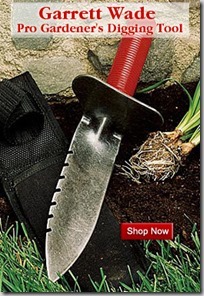 You are so right about edging … a nice sharp edge (I prefer just a nicely cut edge with no “material” — especially not that black rubber stuff) does wonders for a garden. It’s not the most fun garden chore there is (although I bought a mezaluna-type edger thing last year that helped a ton) but it goes a long way to neaten things up. .-= Erin´s last blog ..Get in the mood for gardening =-. I’m with you, Monica. Mowable is key – who wants to fiddle with a string trimmer? I don’t actually own one, I feel so strongly about that. Debbie, you’re so right about the way a light goes off for folks when they realize they can play with the lines out in the garden first! It’s actually pretty fun. Oh gosh, Erin, I hate that black rubber stuff. Erin, I’m dying to see this mezaluna thingie you’re talking about – maybe you’ll do a blog post on that soon? Ornamental grasses are really awesome for pots like these. Or some of the grass-like plants, such as Ornamental Millets, Cordylines and New Zealand Flaxes. Those are awesome suggestions, Fern!